1. When you graduate matters, but maybe not as much as you think. There’s no question that there are better and worse years to become a teacher. The education profession is not immune to larger economic forces, and, just like with all other employers, school districts don’t hire as many teachers during recessions. The effects linger, but in North Carolina at least, it’s not as bad as you might imagine. 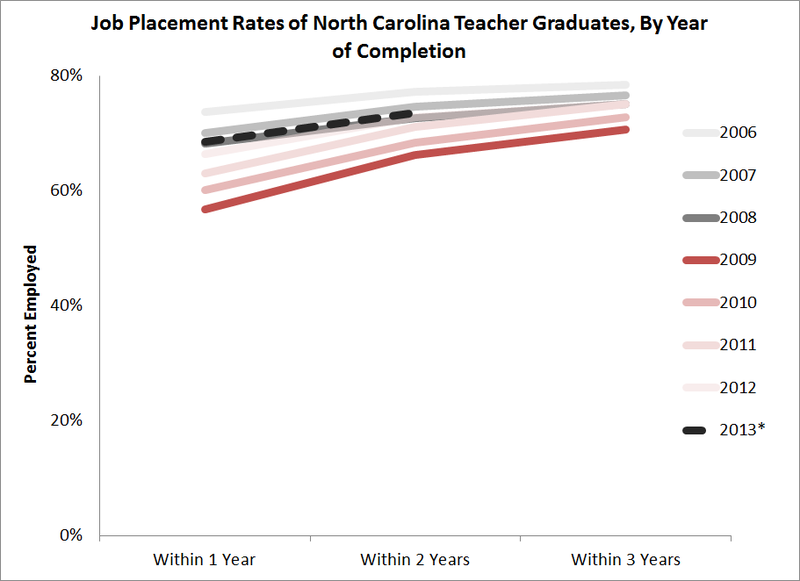 The graph below shows one-, two-, and three-year placement rates for North Carolina teacher graduates, by the year they graduated. This graph shows a few important lessons. First, 2009 was an awful year to graduate with a degree in education and start applying for teaching positions. Compared to other years, graduates unlucky enough to finish in 2009 had lower odds of finding a teaching job within 1, 2, and 3 years’ time. Second, there is some good news here. Note that there’s a much wider gap between the one-year placement rate than the three-year rate. While 2009 grads were 23 percent less likely to be employed after one year than 2006 grads, that gap narrowed to less than 10 percent after three years. 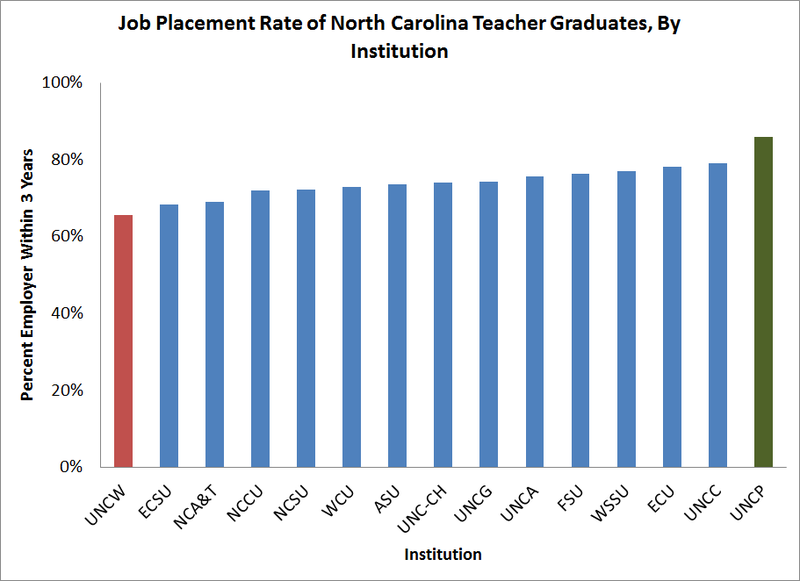 The North Carolina data track placement rates for graduates from the state’s University of North Carolina system. The next graph shows the percentage of teacher graduates who found a teaching job within three years of completion, by institution. It includes teacher candidates who completed their training from 2006 to 2012, so it’s comparing institutions against each other over all types of labor markets. While there is quite a bit of uniformity across institutions, prospective teachers might increase their odds of finding a teaching job by leaning toward one of the institutions on the right-hand side of this graph. * For example, education graduates from UNC-Pembroke had a 24 percent greater likelihood of finding a job as a teacher than graduates of UNC-Wilmington (the green versus the red bar). 3. What subject area you want to teach plays a role in the likelihood of finding a job. Although prospective teachers may not want to change their area of study based purely on their likelihood of finding a job, they should go into their field of study with eyes open. The graph below shows that math and special education teacher trainees were twice as likely to find jobs as teachers earning licenses in pre-k. Health, Physical Education, and Arts teachers also had relatively more trouble finding jobs. None of this should be surprising, and the magnitude of these differences may vary state-to-state, but future teachers should be aware that some paths into the profession are much more competitive than others. 4. The preparation program you attend also influences how long you’ll stay in the profession. This shouldn’t be surprising either. Teacher candidates from alternative route programs like Teach for America and the Visiting International Faculty (VIF) program have much lower three- and five-year retention rates than other routes into North Carolina schools. Of the 213 TFA corps members who started in North Carolina schools in 2008-9, only 77 stayed for three years, and only 24 made it through five years. In contrast, of the 2,044 teachers trained by UNC institutions, 1,507 taught at least five years. Although the retention rates for TFA and VIF are low, it’s worth noting that teachers who come through those preparation routes are better at raising student reading and math scores. TFA corps members in particular out-perform all other teacher preparation routes by a wide margin. Districts hiring TFA or VIF teachers are making a trade-off between faster student growth and more stability within their schools. 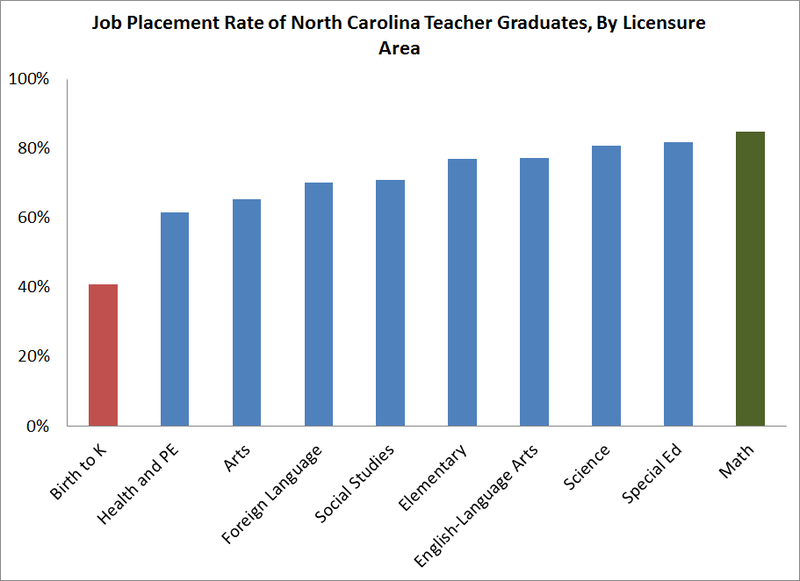 Finally, while these data are interesting and likely relevant to broader national conversations around teacher preparation, it’s worth noting that North Carolina may have a different teacher pipeline than other states. In particular, North Carolina teacher preparation programs seem to have slightly higher rates than Washington or the country as a whole. That’s why it’s important for states to follow North Carolina’s lead and collect this sort of rich data in order to understand the teacher workforce in their states. *To see which institutions the acronyms in the graph correspond to, see here. Can you cite your statements about TFA student achievement?